Designing a beautiful and functional shower enclosure begins with imagination and a vision. But how do you make it a reality? By working with the glazing professionals at Excel Glass. We consult with technical experts for enclosure design and glass size assistance before putting our years of expertise to work in creating your aesthetically pleasing, practical and safe enclosure. To learn more, contact us to have one of our sales staff visit your home to show you hardware & glass options. Just some of the styles and types of framed shower doors and enclosures. 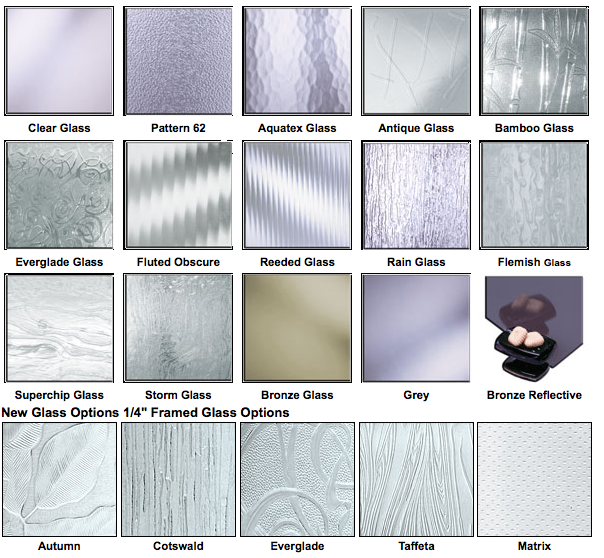 These are just some of the glass styles you can use to customize your shower.